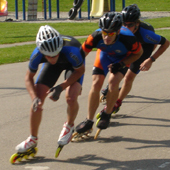 Save the Date: The Toronto Inline Skating Club will hold its Annual General Meeting in conjunction with the Year End Party & Awards on Saturday December 8th 2018 at 4pm. The party will feature a pot-luck (everyone brings some food). We ask that you RSVP (and include the number of guests that will attend). To confirm what you’ll bring as food and to RSVP, please use the Google Doc (use the tab at the bottom to switch between food list and RSVP list). A small group of skaters recently tested skating on a treadmill at Westwood Arena near Finch and Highway 427. Those who set-up this activity would like to extend an invitation to those interested in participating in this training opportunity to do so. If you would like to participate, please contact Peter Doucet at torontoinline@yahoo.com and your information will be passed along. Please get in touch with me by November 13th. A schedule will be organized and those who participate will be expected to pay ahead of time. Costs will be detailed once groups are organized. You can expect to pay up to $50 per session, with a financial commitment of a minimum number of sessions (possibly paying ahead for up to 10 sessions). Please note: This is NOT a TISC organized activity, and all who participate in this do so with the best understanding of risks and dangers involved, and recognize that TISC is not involved in setting up this training opportunity and costs are divided among all who participate. Tonight’s practice is cancelled due to the rainfall. Hopefully see you out on Thursday- and please remember it’s a 6pm start. This is a reminder TISC practices start at 6pm for thr month of September due to the loss in datlight. See you tonight if the weather holds up! A group of TISC members recently traveled to Laval, Quebec, near Montreal, to compete at the 2018 Canadian Championships. Gilbert Crevier, Chandra Mouli Danda, Peter Doucet, Cynthia Head, and Candy Wong competed over two days on the winding course in the beautiful Centre de la Nature. Alain Quintard, TISC Treasurer, was the Chief Referee of the event. All TISC members put forth their best performances, reaching many podium finishes, but more importantly, each coming up with races and a weekend of performances they are satisfied with. Tonight’s practice is cancelled due to the rain + forecast. See you Monday. Tonight’s practice is cancelled due to the storm. See you all on Monday as we prepare for Nationals! Have you registered? The event is set for August 4-5 in Montreal, and it’s free for RSC Registrants (members)!